18”x24” litho posters for $29.98 including tax and shipping. 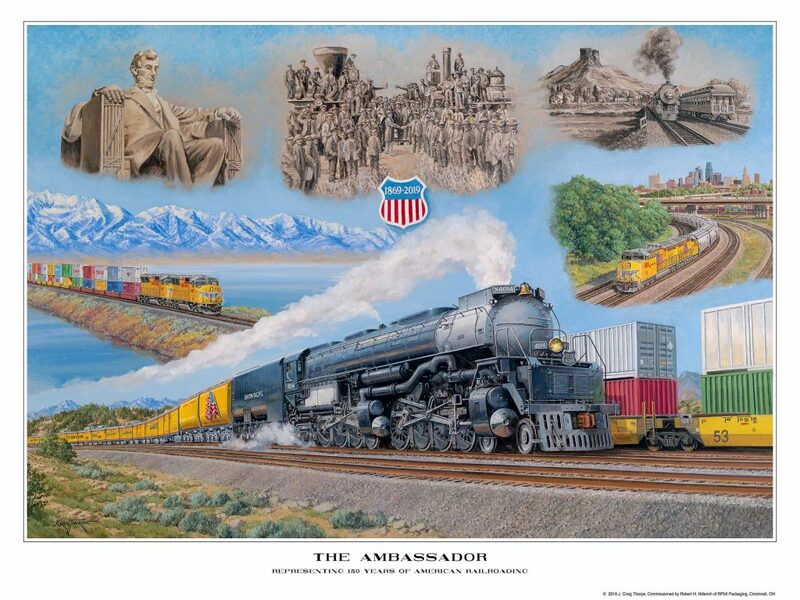 "BIG BOY" COMMEMORATIVE POSTER by J. Craig Thorpe. Commissioned by Robert H. Hillerich of Cincinnati, this 40”x60” oil on canvas painting honors Abraham Lincoln’s vision for a transcontinental railroad, the 150th anniversary of the Golden Spike, the Union Pacific Railroad and the restoration of 4-8-8-4 “Big Boy” #4014. One of 25 such engines built in 1941 for heavy freight service in the Rocky Mountain West, 4014 was retired in 1959 and donated to the Southern California Chapter of the Railway & Locomotive Historical Society. It was displayed at the Los Angeles County Fairgrounds in Pomona until 2013 when the Chapter agreed to return it to the UP for restoration and operation. No other locomotive restoration speaks so eloquently to the scale and power of American railroading nor has the power to inspire a noble future.